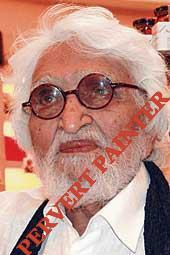 I recently read in the Times of India that our home minister- Mr. P. Chidambaram requested infamous Indian painter MF Husain to come back to India saying that pending cases against him will be quashed and that security will be provided to him. There have also been opinions expressed in this newspaper about some ignorant Indians feeling sorry for him being offered a citizenship by Qatar. Let us put things into perspective- he is an anti-national person who depicted Hindu gods and goddesses in vulgar compromising positions and hurt the sentiments of Hindus around the world! However, he has never dared to represent his own religion- Islam in such derogatory manner. Had he done the same thing in Islam, the same country- Qatar that is now offering him citizenship would have punished him with death penalty! It would have become impossible for him to live anywhere else in the Muslim world! Utter hypocrisy and double standards are clear here! Rational Indians of all faiths must realize that Husain is a pervert who is trying to disturb the communal harmony of our multi-ethnic nation. Rather than feeling sorry or supporting such anti-social elements, we should ensure that such people are given exemplary punishment to deter others from committing such disgusting acts! How to resolve iOS App Store Warning: Your account is not valid for use in the [country] store!